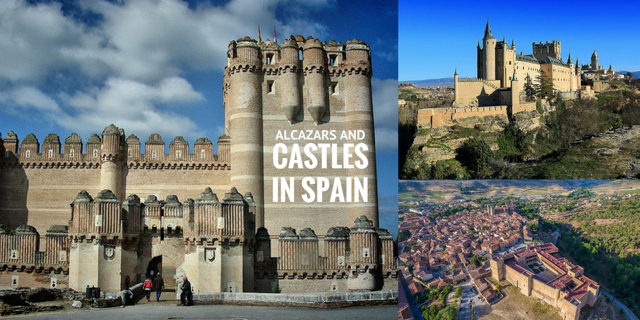 Before we show you 10 of Castile’s great castles, one word you need to know is ‘alcazar’ which means a fortress or palace of Moorish origin. You probably know that words beginning in ‘al’ originate from Spain’s Moorish past. 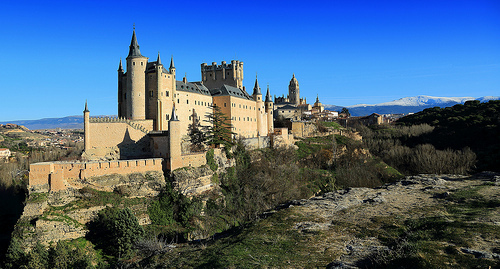 Castile’s most famous alcazar is in Segovia which we highly recommend but you’ll see that many of the others also have Moorish roots or a Moorish past. As you take in the amazing views of stunning landscapes from the castle’s battlements and high towers, you’ll find yourself learning about Spanish history and geography. If that sounds a little too educational for anybody in your travelling party, don’t worry, each castle has its fair share of gory tales of treachery and imprisonment – which tend to go down well with our younger visitors! Technically still in Madrid rather than Castile (and just 35 mins from Madrid Airport) you’ll find Manzanares Castle, at the foothills of Sierra de Guadarrama mountain ridge. ‘Manzanares’ means apple orchards and this castle has, as you’d expect, lovely grounds. The structure itself was built in 1475 on top of a Mudejar Romanesque chapel. Although it was originally designed as a fortress, its function was actually residential as it was the palace of the Mendoza family. Highlights of the visit include the galleries, the wall-walk, the coats of arms and the apple tree in the centre of the courtyard. The castle provides standard guided tours plus a ‘dramatic’ tour provided by two guides in period-costume. The Alcazar in Segovia was built in many stages from the 11th to the 19th centuries – but archaeological evidence suggests that the site has been used to defend the city since Roman times. It’s believed it was transitioned from a wooden defense structure to a royal residence for Alfonso VIII in the 12th century. Royals have made their mark here ever since – the best known being Isabella who sought refuge in the Alcazar the day before she was named Queen of Castille and Leon. When Phillip II moved the royal court to Madrid, the building served as a prison and in the 18th century it became an artillery school. Inside the Alcazar, you can tour some of the artillery and see crossbows, canons and suits of armour belonging to the great and good. We love the public halls, chapel and private rooms where the craftsmanship and artwork is mesmerising. And we recommend you walk up the 152 spiral steps (if mobility is not an issue) to the tower keep which is truly stunning. Make sure to enjoy the silhouette of the Alcazar. If you are still feeling fit after climbing the steps to the tower, you can take a hike down the hill to appreciate the fortress and decide whether or not Walt Disney was inspired by the Alcazar silhouette when creating his company logo. After your visit, we recommend you take refuge in one of Segovia’s many traditional mesones and sample cochinillo asado (roast suckling pig) or any other roast meats for which this city is famed. Walk it all off afterwards by visiting the near-perfect Roman aqueduct that dates from the 1st century AD and was in active use up to the 19th century. Originally built in the 11th century although most of what you see today dates from the 15th century. One of Cuellar Castle‘s best known residents was the romantically named Álvaro de Luna – a politician who rose to great heights before meeting a nasty end (We warned you about the gory stories!). Learn about Alvaro and the first Dukes of Alburquerque plus the many other nobles and royals who passed through the castle. You’ll need to go to the tourist office in the castle grounds to book yourself on a tour. While there, make sure to explore Cuellar’s city walls also. If you visit Coca, you have to see Mota and vice-versa. 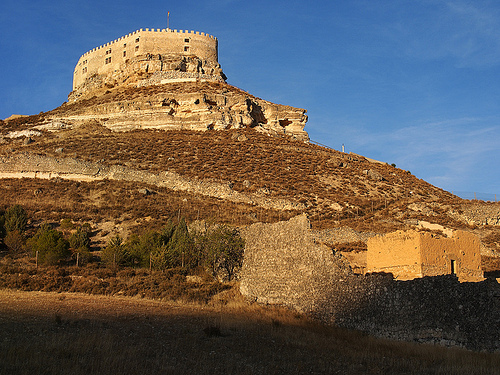 Located nearby in Medina del Campo, Mota Castle derives its name from the moat around the structure. The castle dates from the 15th century although the site has housed a fortress since 1080. You’ll see the coat of arms of the Catholic Monarchs. Important guests here include their daughter, Juana La Loca, who was sent here when her mother Isabella became ill and Juana started showing signs of instability. Take a tour of this dramatic fortress which has served as a Royal Archive, an arsenal for artillery, a prison and a military training school to learn about the other key characters in its history. And the visit to the 40m tower is also well worth doing and needs to be booked separately. Numbers are restricted and tours are limited so try to book ahead. Located on the banks of the river Duero, on the site of an Arab fort from the 9th century, is the 15th century Simancas Castle. 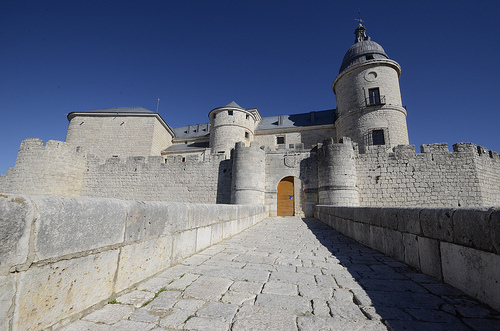 Take a tour of the castle to learn about its early origins and how it was rebuilt by the Admirals of Castile who handed it over to the Catholic Kings, Isabella & Ferdinand. 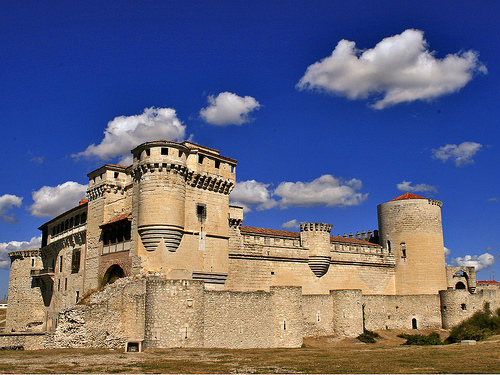 You’ll also hear about its time as a prison until Phillip II commissioned a re-design and dedicated it solely for the state archives. The Archive is well worth a visit – it contains all documents produced by government bodies on the monarchs from 1475 to 1834 and is full of interesting disclosures on diplomatic and commercial relations between Spain and its neighbours and trading partners. It’s a must for any self-respecting historian but you need to request access beforehand. If you haven’t done so before arriving, you can still view the archive’s small museum and exhibition space. If you like to combine gastronomy with history, this is one of the must-sees for you. 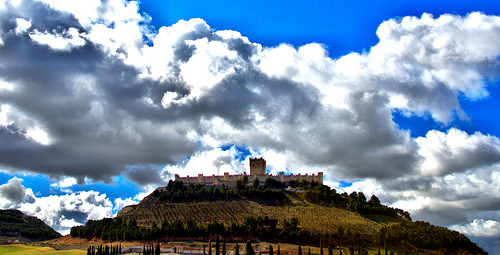 Located in the Duero Valley, a beautiful region famous for its excellent wines, the stunning 15th century Penafiel Castle is built atop a 10th century fortress. The castle has evolved through the centuries. Today it’s often compared to a battleship because of its long narrow structure (210m long x 33m wide). After enjoying the tour of the Gothic styled castle and exploring the 30m high keep, stone vault and the eight turrets, enjoy the amazing views looking out onto the Duratón and Botijas valleys – this area was of strategic importance during the Reconquista. Wine-lovers will be happy to know that, since 1999, the castle has housed the Provincial Wine Museum including a tasting room so if you don’t have time to visit a local winery or two, you can always do some sampling on the castle ground. If you do have some time and are peckish, you should try one of the local ‘asadores’ which are restaurants with a wood-burning brick oven that specialise in delicious roast meats that work wonderfully with a glass or two of Ribera. You’ll find hundreds of wineries to visit after lunch – we are big fans of the Pago de Carraovejas winery and Protos in Penafiel as you can see in our blogpost about touring the Ribera del Duero. 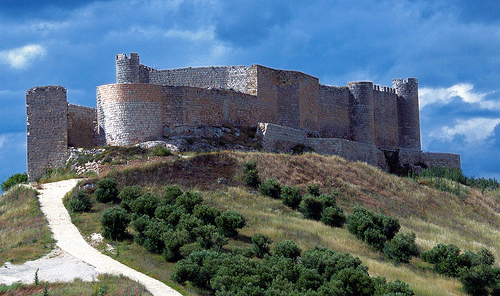 Just a few minutes from Penafiel is the modernised Curiel Castle Hotel that dates back to the 11th century. Not only does it make for a great base for touring Penafiel and the many nearby wineries in Ribera del Duero, it offers an insight into Spanish royal history with each room named after one of the royals who spent time here – and we should warn you that they didn’t all meet happy endings. Stay at one of the suites complete with tapestried walls or stop by for a lunchtime visit where you can taste the seasonal slow cooking using local ingredients. The views are truly astonishing as the castle is literally perched up 927 m in the valley – you can really appreciate the views in this video. The castle has its own bodega located in what used to be a church from the 12th century. We also recommend you visit the nearby Comenge winery too! It’s one of our personal favourites in all of the Ribera del Duero! The Parador at Siguenza Castle in Castilla la Mancha is an imposing medieval structure situated on top of an Arab fortress that was built on top of a Roman settlement. 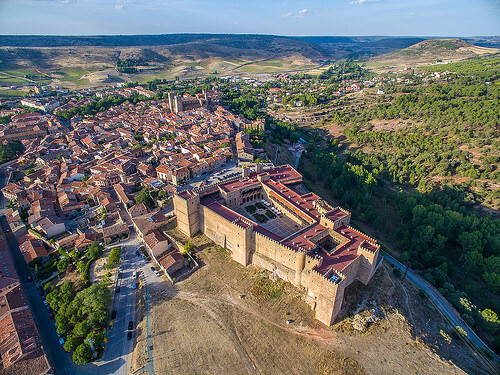 The fortress was the centre for military operations in the fight for the crown of Castile in the 13th Century, during the War of Spanish Succession, and also during the Peninsular and Carlists wars. Eventually it became the Headquarters for the Guardia Civil and finally a residence for the elderly before becoming one of the state-run Parador hotels in 1972. You’ll hear of many legends who lived or spent time at the castle including Peter the Cruel’s Blanca of Borbon who was imprisoned in a cell here. The Parador restaurants always offer a wonderful selection of local specialties and here you’ll find the likes of roasted goat, rabbit and partridge. If you want to stretch your legs after your meal, you should visit the Plaza Mayor from 1494 and see the cathedral and its cloister, but we wholeheartedly recommend you enjoy your time in this castle too. Grab a good book or a coffee and relax in some of the many beautiful areas inside and out that ooze in history. 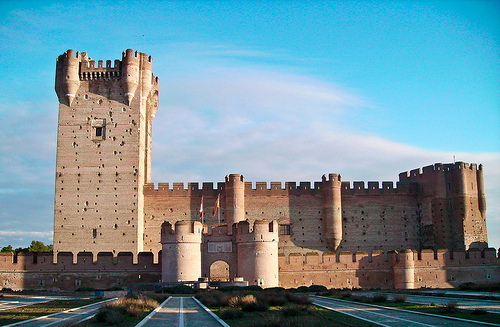 Closing the circuit is the 15th century Jadraque Castle in Castilla la Mancha. 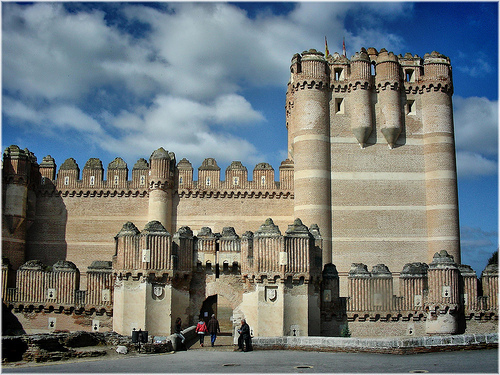 It sits on top of a hill commanding the plain of the Henares river and is part of the El Cid Route. This recently restored fortress is called ‘Cid’s Castle” because it’s mentioned in the infamous Poem of Cid from which much of the route is derived. The castle has passed through many hands including Cardinal Mendoza who is responsible for the structure you see before you today. Built in 1470 in ashlar stone, the structure is rectangular in shape with one rectangular and four round towers. As with many of Castile’s castles, Jadraque is built on an Arab ruin. Visits to the interior are by appointment only (which we can request for you) but even if you just visit the exterior you’ll enjoy walking around the 240m perimeter of the castle and its stunning view of this rural setting. After visiting the castle, you might like to look for the Alcarria and Verdugo palaces from the 17th and 18th centuries in the town. And if you like Zurburan, you should visit the church that displays one of his oil paintings from 1661. From Jadraque, you’re just one hour from Madrid’s International Airport, where you can drop off your rental and fly back home or venture into Madrid city centre. We have only selected a handful of Spain’s alcazars and castles for you. There are hundreds that are equally deserving of a visit. Let us know if you’d like us to program tours to these or any other alcazars and castles in Spain. Posted in Accommodation, Active breaks, Castilla la Mancha, Castilla Leon, Castles, Madrid Region, Paradores and tagged Alcazar, Castile-Leon, Castilla-la-Mancha, castle, Coca Castle, Cuellar Castle, Curiel Castle, Jadraque Castle, Manzanares El Real Castle, Mota Castle, palace, Penafiel Castle, Segovia's Alcazar, Siguenza Castle, Simancas Castle, Spain.